Guitars have always attracted the attention of a lot of people who are into music. When it comes to music, they are one of the important part of human history, which dates back to 2000 BC. The instrument itself underwent a lot of changes in modern times, which can be seen in different styles. You have electric guitars, acoustic guitars, classical guitars etc. I’m going to talk about acoustic guitars as they are pretty basic and very popular. Acoustic guitars have influenced our modern music in a profound way. Whether it is soul or jazz music; they have managed to safe keep their place in our music industry. Acoustic guitars are used in small gigs, stage shows, recording, practicing and many more. They generally consist of steel strings and a body which vibrates and enhances the sound when strings are plucked. 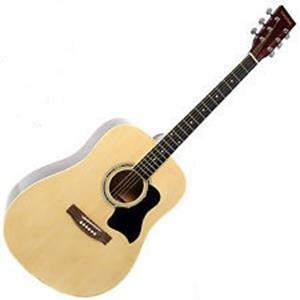 Everyday there are hundreds of people who buy an acoustic guitar, either beginners or experts they all want the best guitar, which is not very hard to find only if you know what to look for. That’s why to make your job easier, we’ll be discussing with you about some great acoustic guitars out there and their features which will help you to choose the right one. 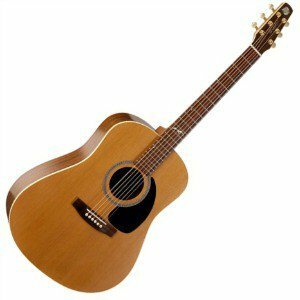 What to look for when buying an acoustic guitar? This beautifully designed guitar is worth every dollar you spend on it. With solid mahogany top, back and sides, this guitar offer great sound. And with the custom polish the sweetness in the sound has been enhanced. The fingerboard and the bridge of this guitar are made of rosewood. The body of guitar is really thin, which ensures better resonance resulting in the perfect sound. This guitar is perfect of intermediate as well as advanced guitar players. It also sounds better than many costly guitars which makes this one a great choice. The strings of this guitar are a bit controversial as not many people love them, but it all depends upon your personal choice. Overall this guitar is a great deal for those who are looking for high quality guitar under one thousand dollars. Belonging to the new series of Cordoba, this guitar offers great resonance and lighter weight with a solid body. For the free movement of the top and very dark tone this acoustic guitar has a mixture of two different types of bracing. One is Spanish fan-pattern Torres style and X-bracing. Because of sides and back being made of solid rosewood, this dreadnought guitar creates an urge in the guitar player for playing its charismatic tone. For clarity in tone it features a bridge made of rosewood and the fingerboard made of the beautiful Ebony and don’t forget about the spruce top which makes it an ultimate choice when it comes to playing clear and dark tones. It can become a great under the budget companion to players at any level of skills. 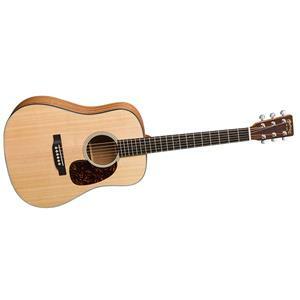 This is one of the affordable acoustic guitars from Taylor. It has the best playability and rich sound which binds the player with it. It has a narrow neck and a very tight action which makes it very easy and fun to play. 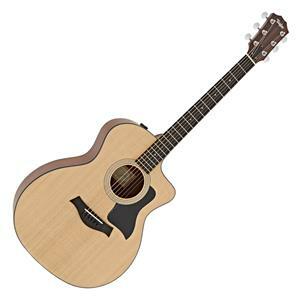 Since this is an acoustic-electric guitar that’s why you can plug it into a sound system to increase the sound with which you can perform for a bigger crowd or you can practice alone with increased volume, it all depends on you. This guitar is a perfect choice as it offers very high action. It has a spruce top and sapele laminated sides and back which give depth to the tone. Every guitar lover should definitely own this guitar because of its awesome quality and pocket friendly price. Yamaha is a brand that always brings perfection to its guitars. This is the reason why this guitar is rich in tone and smoothness. 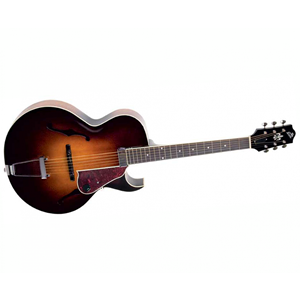 It has a premium spruce top which is great in looks and provides excellent sound projection. The sides and back are made of rosewood which gives authentic bass to the tone. It has an excellent playability and great action which makes it easy to play and have fun with. 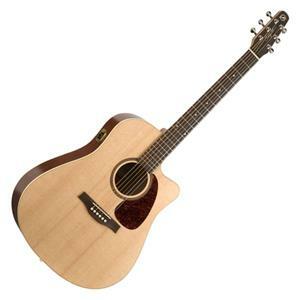 This guitar from Yamaha ensures pickup of high-quality which is great for performing on stage or recording in a studio. Being an acoustic-electric guitar, it allows you to easily plug into a sound system which is a great feature. There are some acoustic-electric guitars that cost around $3000 to $10,000 and offer the same playability as this one, that’s why this guitar is a money saver. In terms of playability and cost, this guitar is beyond perfect. It offers a gentle play because of the top which is hand-carved. It gives great audio for jazz guitar players for a very authentic archtop sound. A profile of vintage “C” with a Mahogany neck adds to its classic design. It has a thin neck and comfortable edged frets make it easy to play. It has a hollow body which results in a very high action of this guitar. Most jazz guitars are really expensive and not everyone can afford them but this great has a great value with low cost which makes it lovable. The sound of this guitar is really warm, which is a perfect choice for jazz because of the archtop. I would definitely recommend this guitar to anyone who is looking for a money saver guitar with good quality sound. This guitar has a solid body with perfect finishing. This is one of the best models from mahogany. The bridge and fingerboard of this guitar are made of rosewood. It has a cedar top which is almost equal to the spruce top offering a vintage tone. The frets of this guitar are very smooth and the fitting is appreciable. It also has a double-functioning and very solid truss rod. Original strings of this guitar are really good so you won’t have to change them as in case of lot of guitars. Sometimes the original strings of the guitar are really terrible, so you have to change them, but not in the case of this guitar. 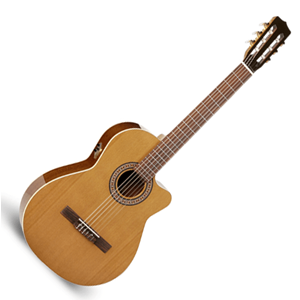 The high quality nylon strings of this guitar ensure smooth playability. Overall, this is a great instrument for a reasonable price. It is a great guitar for those players who want a bright sound. This guitar has a spruce top which is pretty solid. With a vintage nut width, the neck of this guitar is handcrafted. It has tapered fret-ends free of any roughness. It also has a very high-action. This guitar features a high-quality built-in tuner which is easy to use. With great sound and amazing playability, this guitar does not let anyone down because of its price. If you are thinking of buying a quality guitar, then you should definitely go for it. 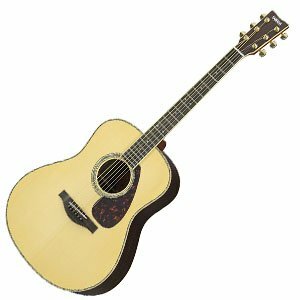 Featuring a powerful tone with very high and easy action, this acoustic guitar has become really popular among many musicians. This dreadnought guitar has a balanced tone. The size of this guitar is really good and can become a great traveling companion. The sound of this guitar is not as loud as an average size dreadnought guitar but sound quality is commendable. The short scale-length of this guitar provides easy playability. The neck of this guitar is a little wider than the other dreadnought guitars of this size, but this does not get in the way of playing chords. This guitar is really good for jamming, recording, or small gigs and you can easily practice on this guitar. To summarize, this guitar is a cordial small guitar with a very rich sound and comes for a price which can’t be denied. This guitar has a very rich sound with good feels. Also, it stays in tune for a long time. 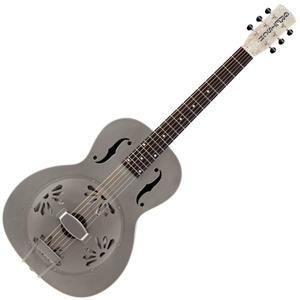 This beautifully designed guitar has back and sides made of solid mahogany. This solid mahogany gives the guitar an authentic vintage sound. There are so many details crafted on this guitar. This is a well-designed guitar with warm tone and no extra glues. The original strings on this guitar are really good. The finishing of this guitar provides the perfect resonance to the sound. The guitar is lightweight with high-action. If we talk about the price of the guitar, then we can say that this does not even cost half of what other dreadnought guitars cost. With low cost, this guitar has maintained a good quality. This is a guitar with extra-ordinary design. It has a brass-body with nickel plating with fine finishing. It has a very beautiful resonating sound and a wonderful playability. It is a bit heavier than an average wooden guitar. It is great for blues music. This guitar has a rich melody. This is a perfect choice for those who want to enjoy the blues. The strings are just perfect and really smooth in terms of sliding as well as picking. Many people wonder what to look for before buying an acoustic guitar because in today’s world you can find anything to everything in the market and when we go to market for buying a guitar, we see a lot of cheap guitars, expensive guitars, or vintage looking guitars that’s why choosing the right one becomes a dilemma on its own. When choosing a guitar, firstly look for the size you want, as they can be anywhere from mini traveling size to a full size dreadnought. It is for you to decide what size you want. Also, the thickness of the neck can differ from one guitar to another. That’s why you should always check the thickness of the neck and see if you are comfortable with it or not. Avoid the guitars with rough finishing as they can have the effect on sound and playability. Check the intonation which means checking the tuning. You can do this by playing an open D or G chord. Before buying a guitar, finalize your budget and look for the guitars that are under your budget range to avoid any kind of confusion while buying. Above I have discussed some great guitars that are under $1000 which offer great sound quality and full comfort. You can always save some money for a perfect guitar because guitars are the instruments that usually last a lifetime if they are of good quality and are taken care of. There is a reason why acoustic guitars are more expensive than any other guitars. 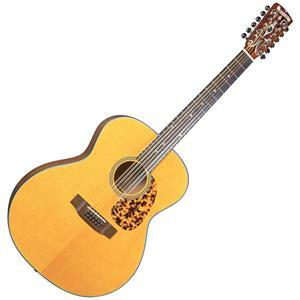 Acoustic guitars are usually made of wood which plays a huge role in the cost of the guitar. If the wood is expensive then the guitar will automatically become expensive no matter whatever the quality of sound is. But remember, not all guitars cost a fortune. Just choose the one you want and buy it if your pocket allows. But always avoid cheap quality guitars because they can really have an impact on your motivation towards music. When we talk about guitars and how they are made or what kind of sound they offer. The main part of owning a guitar is being comfortable with it. If you are not comfortable with your guitar then you cannot play good music. Don’t only go with the reviews. Try to feel the guitar, try to listen to the sound of the guitar and if you love it then go for it. It is your choice that matters the most. If you are still confused, then ask any professional guitarist for their opinion. Also try to compare between different brands, this was you can easily decide which one is better and create your own opinion about them. Try to find out why some brands sell expensive guitars. Without playing you can never decide if it is good for you or not, so always play the guitar. If you know how to play, then it is good and if not, then you can ask someone to play for you. Don’t forget that it is your guitar, which you are going to buy, so buy carefully and never lose your passion.